Introduction s early as the fourth century BC, Hippocrates wrote about gout as an affliction of old men and a product of high living. During the 17th to 19th centuries the links with rich living were a target for laughter, caricature and cartoons. Even the public perception of gout today is not dissimilar – yet nobody who has suffered from this extremely painful condition finds it in the least bit funny! What is gout? Gout is a metabolic disorder that causes acute, intermittent and painful attacks of arthritis in the joints of the foot, knee, ankle, hand and wrist - especially the big toe. If left untreated, attacks become more frequent, more prolonged and more generalised. What causes gout? Gout occurs as a result of excess uric acid (urate) in the blood and tissues. After prolonged supersaturation of the tissues, crystals of urate can form in and around the joints and kidneys. If uric acid crystals enter the joint, they may trigger the development of inflamation. The affected joint becomes red, swollen and extremely painful and tender. Infrequently, stones (calculi) may form in the kidneys. Most patients with gout have high levels of urate in their blood because they do not pass enough in their urine. In most cases this is caused by an inherited peculiarity of the kidneys, which is in other respects harmless. It can also be caused by high levels of uric acid in the diet or by some drugs eg. diuretics. Much less commonly, patients produce too much uric acid in the first place, owing to an inherited metabolic abnormality or disorders associated with greatly increased production of cells in the body. What is uric acid? Uric acid is the end product of purine nucleotide (nucleoprotein) metabolism in all cells of the body. The levels normally found in the blood and tissues are derived from both the breakdown of old cells and from the degradation of purine containing foods in normal diets. Who is at risk? Gout is a common joint disease affecting over five times more men than women. It is rare in children. In men, it can occur any time after puberty, whereas in women it is uncommon before the menopause. In around 10% of cases there is a family history of the disorder. People who are overweight, have high blood pressure, eat diets rich in protein and drink large quantities of alcohol have an increased risk of developing gout. Can I prevent gout? As gout can be triggered by environmental factors, there are some basic steps you can take to help prevent gout occurring in the first place or help prevent recurrent attacks. How do I know if I have gout? Few things are as painful as a severe attack of gout. Gout is usually diagnosed on the basis of its distinctive symptoms and an examination of the joint. An acute attack of gout often develops during the night or early hours of the morning and reaches a peak within a few hours so that, with an affected foot, it is impossible to tolerate even the touch of bed clothes. The skin may be red and shiny and the inflammation may be so severe that the skin may peel. A mild fever, a loss of appetite and a feeling of tiredness can also accompany acute attacks of gout. An untreated attack generally lasts for a few days, then dies down and the joint gradually returns to normal. Will my doctor do any tests? Usually not until the acute attack has subsided, after which a blood test may help to clarify the diagnosis. High levels of uric acid are usually found in patients with gout. However, the level is sometimes normal during an acute attack and the majority of people with raised blood uric acid levels do not develop gout. A more specific test that may be performed is the analysis of the fluid in the affected joint. Fluid from the joint space is aspirated (removed through a needle and syringe) and examined under a special type of microscope. The presence of needle-like, uric acid crystals confirms the diagnosis of gout. However, this approach may not be practical if the joint is a small one. Gout patients have greater than average risk of developing vascular problems such as heart attacks and strokes. Therefore when someone develops gout, this should be taken as an opportunity to look at other aspects of his or her health - such as blood pressure, obesity, cholesterol and sugar levels - all of which can be associated with increased risks of vascular disorders. How is gout treated? The goals of treatment are threefold: The first step is to reduce the pain and inflammation of the acute attack. The second is to reduce the likelihood of future attacks by lifestyle modification and the third is to lower urate levels and so prevent the development of the complications such as joint damage and kidney disease. Step one – treatment of the acute attack During the actual attack, the most important thing to do is relieve pain by controlling the inflammation and immobilising the joint. Currently non-steroidal anti-inflammatory drugs (NSAIDs) such as ibuprofen, diclofenac or indomethacin are used as first-line therapy. NSAIDs with a short half-life, such as indomethacin and ibuprofen are most popular because of their rapid onset of action - although their use should be avoided in patients with a history of peptic ulceration, gastric haemorrhage and renal insufficiency. The risk of gastric haemorrhage may therefore be reduced by the use of some of the newer NSAIDs such as coxibs. Colchicine therapy was formerly the treatment of choice and still has a part to play where NSAIDs are contraindicated. However, it frequently causes gastrointestinal side effects (diarrhoea) and has to be used carefully. If only one or two joints are affected and patients have multiple medical problems or are unable to take oral medications, a corticosteroid suspension may be injected through a needle into the joint space in order to reduce inflammation. Step two – reducing the likelihood of recurrences by lifestyle modification Once the attack has passed, the next step is to help prevent recurrences by addressing trigger factors that can be modified. Patients are advised to lose weight if they are obese, to reduce alcohol consumption (especially beer) and to eat smaller amounts of purine-rich food. Step three – lowering uric acid levels In most patients who have repeated attacks, long-term drug treatment aimed to lower the level of uric acid in the blood is required. This can only be started when the acute attack has settled. This treatment is then continued. The drugs that are used include: ■ Allopurinol, a drug that reduces production of uric acid in the body. This is especially helpful to people who have abnormally high uric acid levels and kidney stones or damage, but it must be used with extreme caution in patients with kidney failure. ■ Uricosuric drugs, such as probenecid, which lowers urate levels in the blood by increasing the excretion of uric acid in the urine. They may not be effective in patients with kidney failure. ■ It is important not to start treatment with uric acid lowering drugs until the acute attack has been settled for at least a week. As there is an increased likelihood of developing further acute attacks of gout immediately after the initiation of treatment with allopurinol or uricosuric drugs, small doses of colchicine or NSAIDs are frequently prescribed along with the uric acid lowering drug for at least three months to prevent recurring attacks. Does gout recur? Some people never experience another attack. If the uric acid level remains high most may have a second attack between six months and two years after the first. Subsequently, attacks become frequent and more prolonged and may result in joint damage if the uric acid level is not controlled. 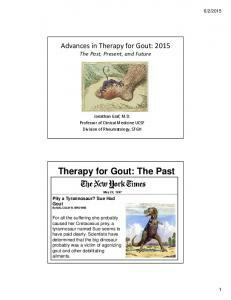 Report "All About Gout A Patient Guide to Managing Gout"